Honey, I shrunk the trash? Each set includes 2 adorable mini storage containers that stand over 5 inches tall. One is a mini curbside trash can, the other, a mini recycle bin. Complete with closeable tops, and real wheels. Great for the office. Honey, I shrunk the trash? 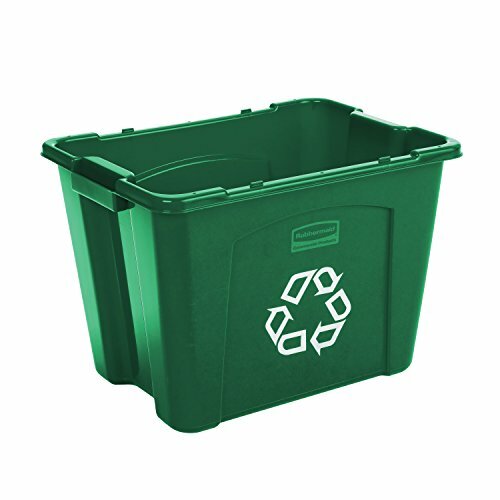 The Storex Medium Recycling Bin is made of durable plastic that will not crack or dent. 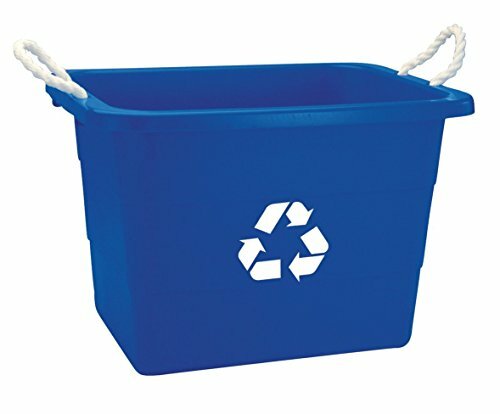 This classic recycle bin displays the universal recycling symbol in contrasting white and is ideal for home or office use. It is sized perfectly to store under the table, desk or in a kitchen cabinet. It holds 26 quarts and measures 15 x 10.5 x 15 inches. Case of 6. Blue. Storex is committed to providing a stylish, quality product that is also environmentally friendly. Recycling bin is made out of post-consumer recycled lightweight linear LDPE, with greater tensile strength than standard LDPE. Stackable for convenient use of multiple containers at one time. Nestable for easy storage and shipping. Meets EPA guidelines for post-consumer recycling. Imprinted with universal recycle symbol. 3.552 inches long by 2.792 inches wide by 4.146 inches high. 4.01 pound. Made in the USA. Witt metal recycling container Great for companies seeking "Green" compliance Provides an aesthetically pleasing recycling container within a small area Servicing is easy with the lift off top, separate liner for each stream. Blue color. Measures 15" diameter by 32" height. 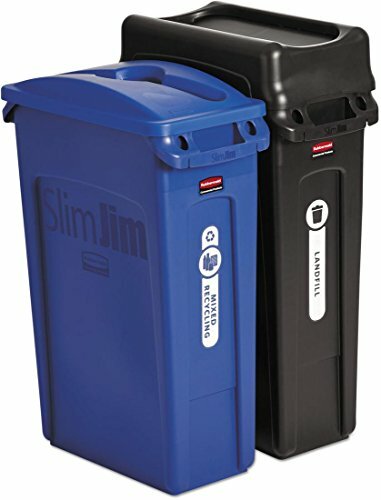 Rubbermaid Commercial Slim Jim 2-container Recycling Set - 23 gal Capacity - Blue, Black Recycling Kit contains one black vented Slim Jim (23 gallon) with corresponding swing lid and one blue vented Slim Jim (23 gallon) with corresponding mixed recycling blue lid. Slim Jim containers deliver the durability needed for commercial environments combined with innovation to increase worker productivity. Venting channels make removing liners up to 80 percent easier, improving productivity and reducing the risk of worker injury. Space-saving profile fits virtually anywhere. Bag cinches secure liners around the rim of the container and allow quick, knot-free liner changes. Base and rim handles improve grip and control while lifting and emptying full containers. Swing top provides easy access for trash disposal and then swings back to hide trash from public view. Two-stream kit also contains one assorted waste stream label kit with seven waste stream labels, ensuring waste-sorting accuracy. Label names include landfill, paper, glass, plastic, cans, mixed recycling and organic waste. Brand: Rubbermaid Commercial | Manufacturer: RUBBERMAID COMMERCIAL PROD. 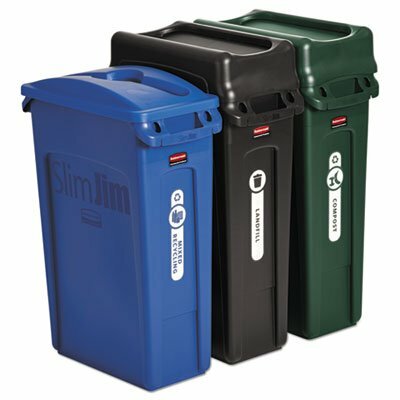 Rubbermaid Commercial Slim Jim 3-container Recycling Set - 23 gal Capacity - Blue, Black, Green Recycling Kit contains one black vented Slim Jim (23 gallon) with corresponding swing lid; one blue vented Slim Jim (23 gallon) corresponding mixed recycling blue lid; and one green vented Slim Jim (23 gallon) and corresponding green swing lid. Slim Jim containers deliver the durability needed for commercial environments combined with innovation to increase worker productivity. Venting channels make removing liners up to 80 percent easier, improving productivity and reducing the risk of worker injury. Space-saving profile fits virtually anywhere. Bag cinches secure liners around the rim of the container and allow quick, knot-free liner changes. Base and rim handles improve grip and control while lifting and emptying full containers. Three-stream kit also contains one assorted waste stream label kit with seven waste stream labels, ensuring waste-sorting accuracy. Label names include landfill, paper, glass, plastic, cans, mixed recycling and organic waste. Helpful in separating waste from recyclables in public areas. 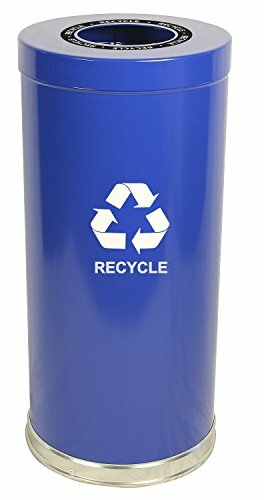 Space efficient receptacle for recycling. Mix and match Geo cube for unique combinations. Round opening lid for cans and bottles. Compact and fire safe steel construction. Sort recyclables easily. Attractive, functional choice for airports, malls, auditoriums, or as part of any organization's recycling program. Scarlet Red color. Measures 15" length by 15" width by 32" height. For indoor use. The United Solutions 34-Gallon/128.7L Wheeled Rectangular Blow Molded Recycling Can is designed to hold recyclables and has many other uses. Fill it with trash/waste, lawn clippings, leaves, mulch, compost, potting soil, lawn and garden chemicals, sporting gear and much more. Durable locking handle keeps lid secure and allows easy transport. 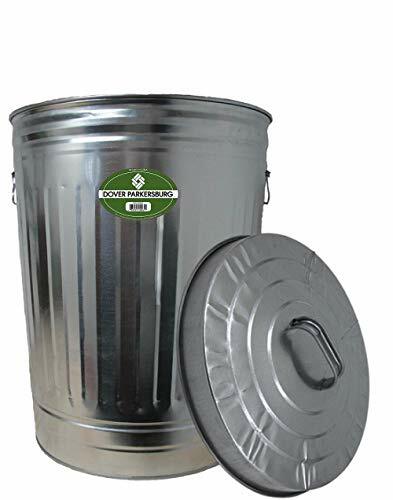 Built with the highest quality galvanized steel, this trash can is durable and made to last. Features an offset bottom to keep the can off the ground, durable wire handles for easy portability, and tight-fitting lid. This can is ideal for trash, yard waste, and larger pet food/livestock feed storage (approximate hold capacity is up to 100 lbs*). A stronger alternative to plastic, this can is rodent proof, recyclable, and weather resistant. Dry storage only. Made in the USA. May contain globally sourced materials. *Hold capacity will vary depending on particle size. 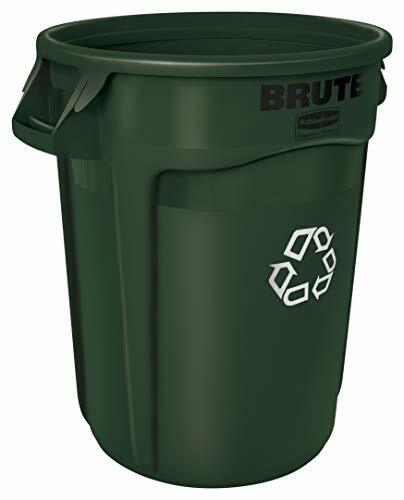 Rubbermaid Commercial FG270388GRN Slim Jim Rectangular Paper Recycling Container Top, Green. Easy hygienic access for recycling. All tops fit on 3540, 3541, 3554 containers. Interchangeable, color-coded tops promote waste separation. 20.394 inches long by 11.417 inches wide by 2.795 inches high. 0.827 pounds. Made in the USA. Easy hygienic access for recycling. 20.394 inches long by 11.417 inches wide by 2.795 inches high. 0.827 pounds. Made in the USA. 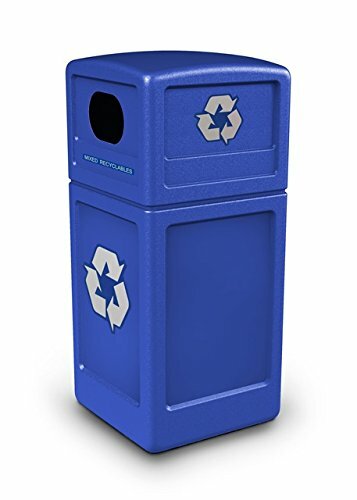 74610499 Color: Blue Features: -Recycling can with custom decals and logos.-Environmentally Friendly, molded from at least 25 percent post consumer recycled material.-Double-sided dome top keeps rainwater out.-Patented Grab Bag System holds bag in place.-38 gallon capacity. Includes: -Two sets of decals included, Plastic bottles, Aluminum, Glass, Plastic Bags, Paper, Mixed Recyclables, Trash and recycling logos. 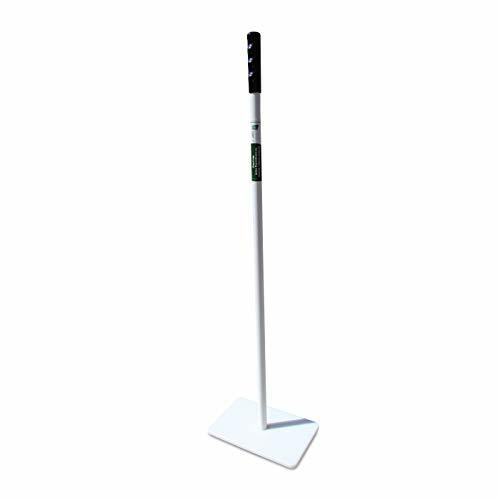 Dimensions: -Overall Dimensions: 38'' H x 18.5'' W x 18.5'' D. Warranty: -1 year warranty. Garbage disposal is a huge problem in the commercial sector as the amount of trash is excessive. That is why this manual trash compactor - Tamp-It is all the more necessary to reduce the volume of trash and make disposal hassle-free. Increase Space Since the manual trash compactor reduces the quantity of trash, it frees up more space and prevents overflowing trash cans. You can dispose more waste in one go! Effective You don't have to touch the trash in any way - this gadget helps to compact thorny tree shrubs, flowers, lawn trimmings, leaves, and any kind of yard debris, in the most efficient manner. There is absolutely no need to put your hands and feet into the trash receptacle. Convenient Constantly emptying waste baskets is a tedious job, but it has to done on a regular basis as you can't let trash accumulate. However, the rod trash compactor significantly decreases the number of trips you need to make for emptying dumpsters when they become full. Easy to Maintain Rest assured you don't have to go through complex instructions to keep Tamp-IT clean - it can be done via a simple method of using soap and water. Moreover, it doesn't allow rust or corrosion to build up on the surface. An extremely useful tool to make trash disposal hassle-free - hurry and order now! Versatile - The manual trash compactor is best suited for commercial areas such as restaurants, kitchens, school cafeterias, parks, malls, warehouses, factories, campgrounds, amusement parks, etc. as the volume of waste in these places is significantly more. Cost-Effective - The more you schedule weekly trash pickups, the higher it will cost you. But if you can reduce the amount of trash thrown by compacting it, you can opt for a pickup as and when required. It helps to save money in the long run. Better Hygiene - Tamp-IT lets you compact the trash quickly so you won't have unsightly and smelly waste overflowing from dumpsters. It is not just good hygiene but a receptacle brimming with trash in a parking lot gives an awful first impression. More Storage - When the quantity of waste is large, you have to make frequent trips to empty the bins or cans. 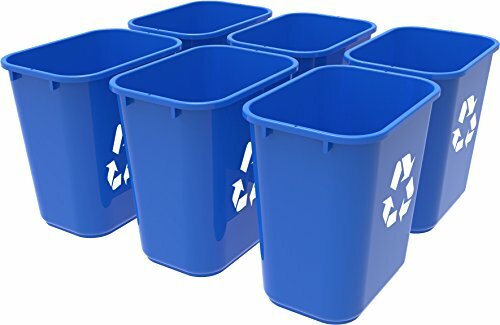 But when the trash is compacted it frees up more space in trash receptacles, so you can eventually throw out higher amounts of waste in one go, while the number of trips are reduced. Make life a little easier with the Step N' Sort 2-Compartment Trash and Recycling Bin. This sleek, double-sided set sorts trash and recycling into two separate sections for effortless disposal. 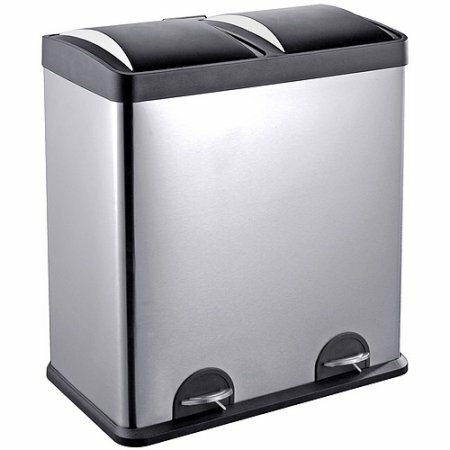 The 2-compartment trash bin has a rugged steel frame and heavy-duty recycled plastic inner bins to withstand regular use. The unit is equipped with step pedals for effortless, hands-free operation. The recycled plastic-trimmed lid opens with just tap on the pedal, without the need for batteries. 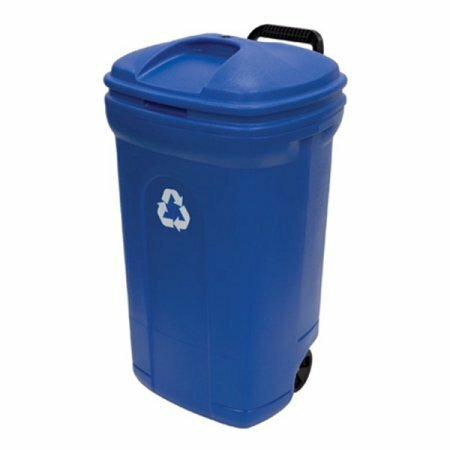 The 16 gallon recycling bin's two compartments have an eight gallon capacity; when removed, the bin increases to a 60 liter capacity. Rubbermaid Commercial Square Recycle Bins are perfect for use in areas of high paper generation, such as near copiers, printers, and in mailrooms. 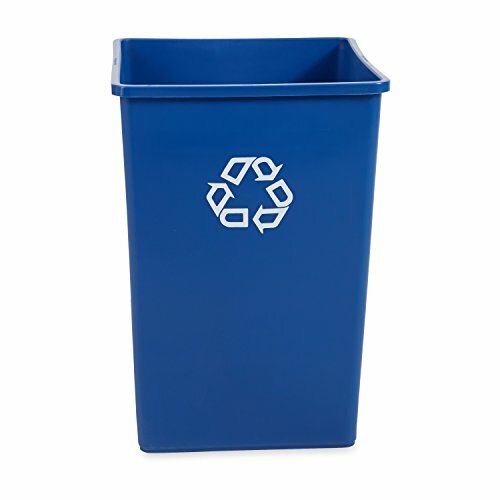 This recycle bin contains Post-Consumer Recycled Resin (PCR), exceeding EPA guidelines. The recycling bin station containers serve as a convenient central collection site for multiple work stations. Recommended for indoor and outdoor use. The large capacity ideal for heavy traffic areas. 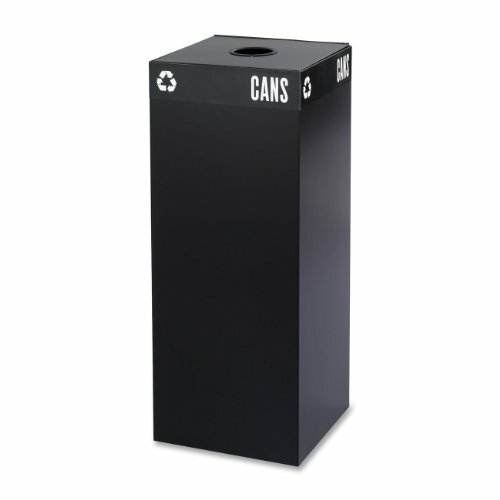 These recycle bins are designed to withstand extreme weather and handling.